The QSI Crew is all packed up and heading out to the Shooting, Hunting and Outdoor Trades (SHOT) Show in Las Vegas! We’ll be arriving tonight and staying for the entire show. Watch this blog for updates from Erik, Mark, Josh and Gabe. We’ll be also be partnering up with Short Barrel Shepherd to review and report on the newest guns, gear, and other products for 2015! What do YOU want to see us check out? Let us know in the comments. This course provides begins with a review of core handgun skills and moves on to advanced techniques. This is an advanced course for experience shooters and requires the QSI Defensive Handgun or equivalent as a prerequisite. Suitable Defensive Handgun (no .22 or target pistols). We spend a lot of time in our vehicles, so it only makes sense to learn to fight in and around them. This course will focus on the handgun and other EDC (Every Day Carry) weapons. Students will conduct dry practice and live fire using vehicles on the range. The is an advanced skill level course. QSI Advanced Handgun or equivalent is a required prerequisite. If you have questions about prerequisites, please feel free to contact us. This course is designed to provide an introduction and build basic skills for the defensive shotgun. Many US households have a shotgun sitting in a closet with the intent of using it for self-defense. Learn to use the shotgun effectively to defend your home and family. Suitable defensive Shotgun: 12-gauge pump or auto recommended, but not required. Rental guns available for additional charge. A self-defense scenario can be expected to happen quickly at close range – and you may not even have time to draw your gun. This class is designed to teach techniques for drawing and shooting at close range distances. This class teaches advanced techniques and is intended for experienced shooters. 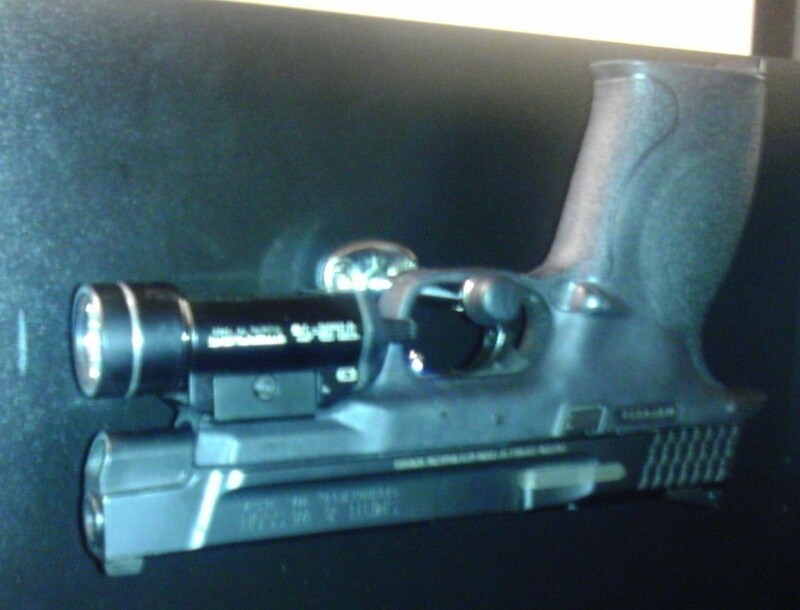 QSI Advanced Handgun or equivalent is a required prerequisite. If you have questions about prerequisites, please feel free to contact us. This class will be a combination of our Permit to Carry Combatives and Force on Force training. Emphasis here will be on fighting at extremely close range and in tight spaces. Participants will learn close-quarter defensive tactics, empty hand self-defense techniques, deploying intermediate weapons (such as mace or batons) and weapon retention and disarms. Participants will then participate in a series of Force on Force scenarios designed to challenge the student’s situational awareness, reaction to danger, and overall fighting skill. Scenario-based exercises will allow you to practice your defensive pistol skills against live opponents in a dynamic Force-on-Force environment. Blue Guns, Airsoft and other training weapons will be used. This law-enforcement training facility features an indoor training space with several different scenario rooms. Some physical contact will take place during this training. We have loaner equipment if you don’t have your own – just let us know in advance. There’s a new slur in town, courtesy of Bill Mahr. “Ammosexual.” It seems to be catching on in social media and elsewhere. When you need to use a slur or insult to describe your political opponents, it’s clear that the logic is draining out of your argument. Of course, gun control advocates prefer emotional arguments to logical ones, which is all the more reason why using slurs suits them. The feeling behind using a slur to describe a person (or group of people) is to marginalize and dehumanize them. In extreme cases, it’s used to reinforce the belief that they are less than human. In wartime, soldiers (right or wrong) will often apply slurs to our enemies so we don’t see them as people, making them easier to kill. I find it very ironic that “ammosexual” is a portmanteau of “homosexual”. Mahr and his supporters are using the same tactics against us that they claim to believe should not be used against GLBT folks. Using slurs to describe people is wrong, no matter who it is. Trying to turn a person into a second-class citizen is wrong, no matter who it is. Mahr’s camp is taking a page from the playbook of racists and homophobes. Owning a gun, for me, and people like me, is a “lifestyle.” I’m proud to be a member of the American Gun Culture, a unique group of people with a long and storied history. An important part of being free is honoring your neighbor’s choices, even if you disagree with them. Intolerance is wrong, and they are wrong too. The other day I found myself using a fairly secluded restroom and, remembering this, took some quick pictures to illustrate what you should (and shouldn’t) do. So, if we can get through this without giggling, let’s talk about what to do with our guns when nature calls. DO use the stall instead of a urinal (yes ladies, I know you don’t have a choice). Using a urinal puts you with your back to the door, facing the wall, with your gun hand occupied. It’s very easy for someone to come up behind you and slam you into the wall. On the other hand, the stall door, while not exactly Fort Knox, slows down an attacker long enough for you to react. DO keep the gun under control. There are some different options available, depending on how you are dressed. 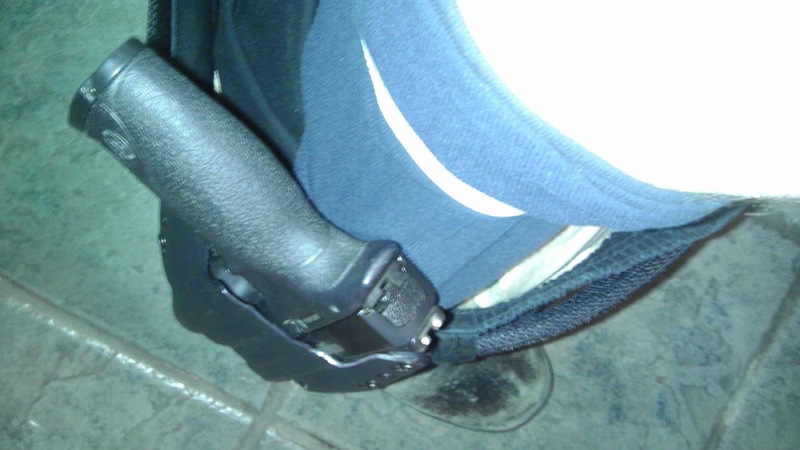 If you keep your knees apart, tension on the belt will keep your gun and holster from falling to the ground. The heavier your gun, the less likely this is to work. 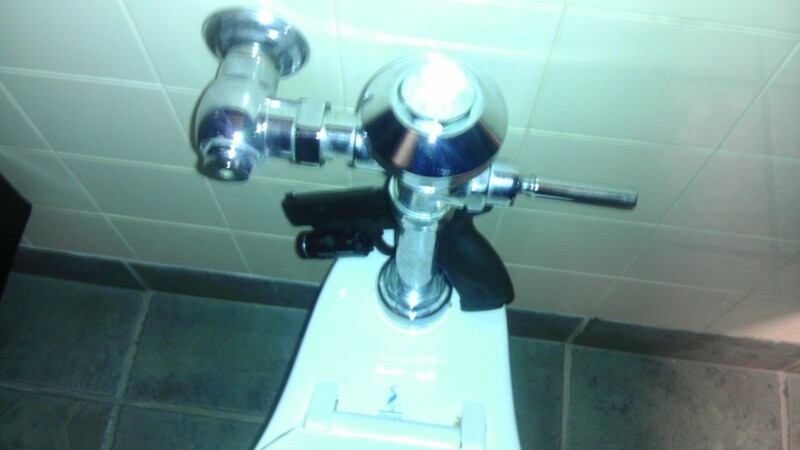 Sometimes the stall will have a handy shelf or other spot, such as this toilet paper dispenser, you can set your gun on. Before doing so, make sure it’s a flat surface. Many of these items have curved tops and the last thing you want is your gun clattering to the floor. If you have to “balance” your gun on the object, it’s not going to work. I prefer taking the gun out of the holster and setting it in the crotch of my pants. It’s still immediately accessible and I’m not going to forget it’s there. DON’T put your gun anywhere it can be grabbed, forgotten, or worse. 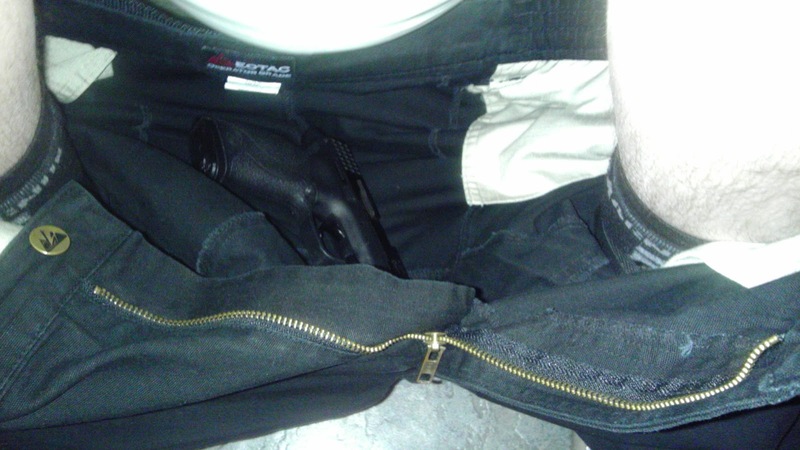 Stashing your gun behind you on the toilet might seem like a good idea, but once it’s there and you start to take care of business, it’s out of sight and difficult to reach. Being out of sight increases your chances of forgetting it. Here in Minnesota, forgetting a gun in a bathroom isn’t just embarrassing, it’s potentially a crime. Minn. Stat. 609.378 makes it a Gross Misdemeanor to “leave a loaded firearm in a location where the person knows that a child under 18 is likely to gain access.” There have been cases of permit-holders being charged under this statute after leaving guns in bathrooms. Placing your gun on the floor is also a bad move. Don’t forget you may not be alone in the bathroom and the guy in the next stall will be able to see your gun. He might either grab it and take off or whip out his trusty cell phone and call 911, creating an unplanned police encounter. 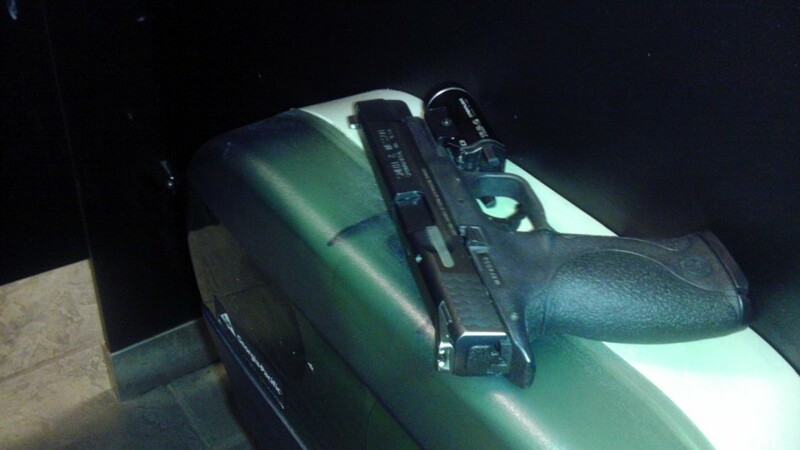 Please, please, please never do this: hang your gun on the hook on the stall door. I did it here with a triple-checked unloaded gun for demonstration purposes, and it still made me very uncomfortable. Aside from having your gun out of reach while you are doing your thing, it’s not a stretch to see how this could result in an accidental discharge when the hook hits the trigger as you try to retrieve your gun. Worse, the recoil from that accidental discharge could result in another discharge. A local gun show promoter was seriously injured in just this fashion. Use the hook for its intended purpose: hanging up your concealment garment. Going armed means your gun is with you and accessible all the time. Public restrooms have been the scenes of violent crime. 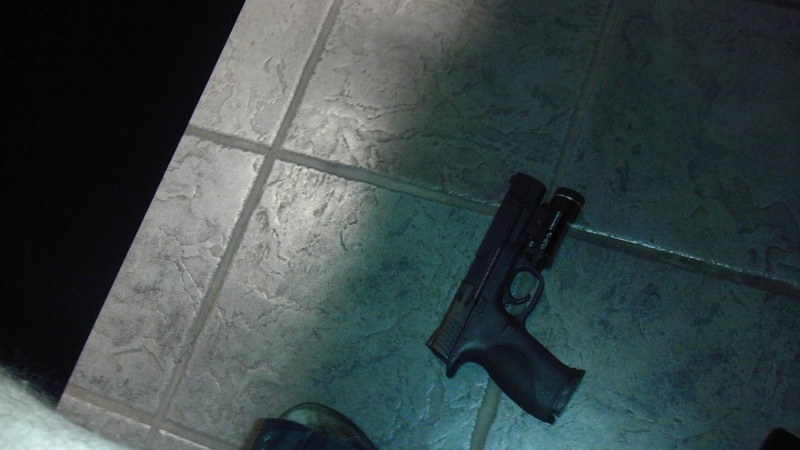 It makes sense, if you are carrying a pistol, to keep it handy, even in the bathroom. Remember when you were sixteen (maybe older) and got your first driver’s license? What kind of a driver were you? Chances are, you stepped on the brake (and gas) a little harder than you needed to, probably held the steering wheel a little tight, and probably had your fair share of “near misses” or even accidents. Now that you’ve been driving for a while, you do a lot of it intuitively. You don’t really think about stepping on the brake when you need to – you just do it. You manipulate the gas pedal and steering wheel of your car without much thought, as you’ve grown comfortable doing it every day. For most of us, our car is an extension of ourselves, and we know just how to make it do what we want it to do. Relying on just your carry permit for adequate training is like driving a car when you you’ve just got your license. For any skill to become proficient, you have to practice, and you have to practice correctly. You get good at driving because you drive every day…and you’re only going to become a better shooter through practice and training. One other thing about those sixteen year old drivers – most of them think that they’re good drivers and they are unlikely to have accidents. Statistics, of course, show just the opposite. But if you asked your average sixteen year old if they were a good driver, they’d probably say they were. Don’t shoot your gun like a sixteen year old drives. Get some training, and keep practicing. Shooting is a perishable skill that must be continually refreshed.